Very complex with oaky floral notes on the nose. Hazelnuts and yellow fruit. Very full-bodied attack. Fleshy fruit and round palate. 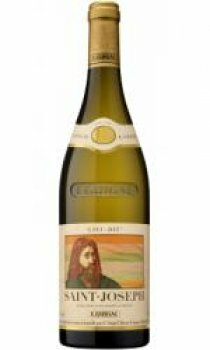 Overall a balanced palate with complex aromas and a roundness which is very characteristic of this Saint-Joseph which comes from the best terroirs of the appellation. This wine is a unique expression of the excellence of the lieu-dit Saint-Joseph appellation and these vineyards are from amongst the very best of this up-and-coming appellation in the northern Cotes-du-Rhone. These very slopes lent their name to the Saint-Joseph appellation when it was created. The label was designed by Roger PFUND, a Franco-Swiss artist who is a specialist in the design of bank notes.